It has been a pleasantly relaxing long weekend and although Saturday's weather was murky and unpleasant, yesterday and today have been glorious, perfect late summer days, and I've been out and about and busy in the garden. Here are a few pictures. I had a lovely walk on Bransdale Moor on Sunday afternoon, enjoying the colour and scent of the heather. A white clone was a lucky find at the first place I stopped: it was the only white one seen all afternoon. A first and last visit to Mount Pleasant Nursery, Leavening today: they are having a closing down sale and I picked up a car-load of good plants at bargain prices. The perimeter border is planted by colour and this yellow section was rather striking. The first Colchicum of the autumn: British native C. autumnale. Very definitely not a 'graveyard anemone', before anyone thinks it: 'Wild Swan' is a delight, fully worthy of its Chelsea Plant of the Year 2011 award. The fern border this evening. 'Red Gurkha' coming of age. When my plants of Roscoea purpurea 'Red Gurkha' came into flower I thought, 'it's just twenty years since you were introduced' but when I checked, I found that it was actually discovered and brought into cultivation in 1992. I ought to have known this perfectly well as the participants in the Oxford University Ganesh '92 expedition that found it were friends of mine (Bill Baker, Tom Burkitt, Jonathan Miller and their Nepalese counterpart Rhidaya Shrestha) and I'd advised them while planning their trip. Their aim was to locate Pleione coronaria, then a very poorly known species, in the Ganesh Himal in central Nepal and study its ecology. 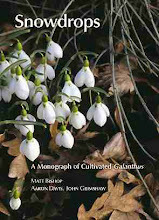 They did this successfully, but the expedition's major triumph was its discovery of not only a red form of Roscoea purpurea but also a new species, Roscoea ganeshensis, as well as introducing R. tumjensis and reintroducing R. capitata and R. alpina. In fact it turned out to be a colour variant of the widespread Himalayan species R. purpurea and when published in what was then The Kew Magazine in 2004 was given the evocative name 'Red Gurkha'. Although we all still know it as this, giving a single cultivar name to a wild population was unfortunate and has caused much confusion since, leading to the publication in 2007 of the epithet forma rubra for all examples of this colour form from the Ganesh Himal. Plants brought back from Nepal varied in the pigmentation of the leaf bases, with some being green and others red: the red-pigmented ones are the more striking. The effect is just visible in the top image. This is an original clone, BBMS 45: it has never produced seeds for me, but others have produced whole battalions of Red Gurkhas, and some very fine hybrids too. It likes rich moist soil and light shade: this clump is in my fern border, which gets sun for only a short period each day: another group, in full sun in the open border, are very unhappy and will need rescuing. The scarlet flowers of R. purpurea f. rubra are really striking, and unique in the genus. To my knowledge it has only been collected by the Ganesh '92 expedition. Monarda 'Gardenview Scarlet' - my favourite of the reds. The slightly shadier end of the main border: Nepeta kubanica and Persicaria amplexicaulis 'Dikke Floskes' are conspicuous. Too many reds but they are too beautiful to pull out. An old, very hardy favourite: an apricot Gladiolus dalenii or primitive hybrid, originally from Cotswold Garden Flowers. In the border alongside the drive: Lythrum virgatum 'Dropmore Purple', Helenium 'Sahin's Early Flowerer', et al. The drive border in late afternoon: the tall Dahlia is 'Night Queen', a serendipitous garden centre package purchase. Agastache pringlei comes to life in evening light. The best of several Tilia tomentosa 'Petiolaris' in the Yorkshire Arboretum, planted in 1979: still a youngster. For the past few days the scent of a lime-tree has been blowing about the Yorkshire Arboretum on the warm breeze and perfuming the air most delightfully. The great trees of the Castle Howard avenue finished flowering some weeks ago, so I tracked it upwind to our grove of Tilia tomentosa 'Petiolaris', the weeping silver lime, of which we have about 10 trees, planted in 1979. 'Petiolaris' is one of the noblest of big trees, easily achieving 30 m in due course, and rivalling anything in its magnificence of strong limbs and broad crown, but its great beauty comes from the pendulous branches and the curious twisting of some of its petioles, resulting in the white underside of the leaves being turned upwards. The canopy thus looks silvered at all times, but especially when shivered by a breeze. It has been valued for this feature for a long time - the records suggest it was first planted in England in the 1840s, but its real origin is hazy but it may have come rom the Ukraine. 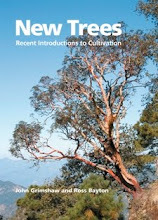 The relationship of 'Petiolaris' to Tilia tomentosa, the common silver lime of the Balkans and eastern Europe, has been debated for years, but Donald Pigott, whose life-long study of Tilia was published last year (Lime-trees and Basswoods, Cambridge University Press), is of the opinion that it is merely an unusual clone of T. tomentosa. Twisted petioles reveal the white undersides of the leaves. The flowers are borne extremely profusely, and as noted above, are exceptionally fragrant. They make a delicious tisane when steeped in hot water, and on the tree attract a huge number and diversity of insects. Our trees were humming with the sound of insects today, lovely to hear - what Matthew Arnold called 'the live murmur of a summer's day'. The flowers of Tilia tomentosa 'Petiolaris' are wonderfully fragrant. There have been huge numbers of Peacock butterflies in the arboretum in the past week: this one had joined the throng of bees and hoverflies on a 'Petiolaris' tree. Helen Dillon's garden, from her drawing room: a town garden that seems much larger than it really is, packed with good plants and good planting. Helen Dillon is the grand dame of Irish gardening, so far as I can tell, and I've not heard of any serious rivals. She speaks as she writes; staccato, brisk, opinionated: but her opinions change, and her garden changes and the high-powered charge that results is what makes a visit to 45 Sandford Terrace, Ranelagh, such an exciting pleasure (see website here for opening information). The front garden is a rather formal affair, suiting the Georgian townhouse rather well, with a grove of 51 Betula 'Fascination' along the side; the fireworks begin on the other side, where in the comparatively small back garden Helen has created and re-created a series of gardens over the past forty years, each bringing a new take to her passion for good plants and their appropriate placement. But as she says in Helen Dillon's Garden Book (2007): 'My idea of heaven was (and still is) to indulge in a lavish buying spree. And the consequences? Too bad. Bugger plans.' But this doesn't mean the garden is a random jumble; the plans may be buggered but the plants are carefully placed, creating striking combinations of colour or texture. Many big plants are in fact grown in pots (or galvanised dustbins) and much of the colour visible in the birders alongside the rill (above) is from such potted plants. The rill, with its grand parallel borders, is the centrepiece of the garden, best seen from the drawing room. It replaces various incarnations of lawn and borders and fits the space beautifully. Behind these borders are a series of garden areas in parallel: a charming and very well-stocked greenhouse, raised beds, vegetables, an aviary with delightful Diamond Doves and Bengalese finches, a gravel garden, ferns in cool green shade... I often find it difficult to see the garden for the plants, and this was a classic case: being mesmerised by the plants I didn't take many pictures of the garden spaces, and keeping up with the conversation also needed concentration. Helen is a generous hostess and Jimi Blake and I came away with a lot of cuttings and divisions ('I won't look') - I hope I can do justice to mine. Thank you Helen! The very tall Dahlia 'Admiral Rawlings' - a stunner for a big border. The striped carnation 'Chomley Farran', found at an antiques fair by Helen and begged from its namesake. I have been coveting the China Rose 'Louis XIV' since I first saw it in the Dillon garden years ago: a weak, dwarf bushlet, Helen says it needs constant applications of RoseClear, but the velvety flowers from small black buds are worthwhile. Cuttings are now in my propagator. Helen Dillon and Jimi Blake discussing plants in the gravel garden: in front of them is Verbascum 'Frosted Gold', which Helen has kept going, almost single-handedly, since she got it in the '70s from Mrs Desmond Underwood. For all the changes some things are constant: this superb clump of Veratrum album has been in situ for 40 years. Typha minima and the rill. The view across June Blake's garden from below an almost horizontal larch. For a family to have two exceptional gardeners is extraordinary, but such is the case with the Blakes: just down the hill from Jimi's Hunting Brook is his sister June's property, known to the world simply as June Blake's Garden (website here). Both are great, exciting gardens full of good plants intelligently and boldly used: they have similarities but also great differences. The core of June's site is largely flat and lends itself to a more formal design structure - which it has been given - and the main borders are perhaps planted more solidly. Anyone interested in good planting, and good plants, needs to see both: they are entirely complimentary to each other. Many thanks to June for showing me round, and for the plants, seeds, and inspiration I brought away. June Blake's Victorian home: tradition meets contemporary design in both the garden and in the modern extensions and renovations to the buildings. Rich plantings in the hot border. Cotinus 'Grace' and Crocosmia 'Lucifer' - a perfect match. Looser planting characterizes the prairie garden, though here a sinuous low box hedge gives definition between Achillea and Knautia. Pulmonaria 'Blake's Silver' was a seedling in the garden: it is a very striking plant, here forming a river between very dark-flowered Primula florindae hybrids. Adjacent to June's garden is the Cow House, a magnificently converted barn available for holiday lets. This is a screen of sheet iron pierced in the shape of Cardiocrinum flowers - a beautiful piece of art.